Comfort Bands infomation page for sweatband, sweatband, athletic sweatband, perspiration band or strip, perspire band strip, soaker device, sweat soaker, forehead band, forehead sweatband. 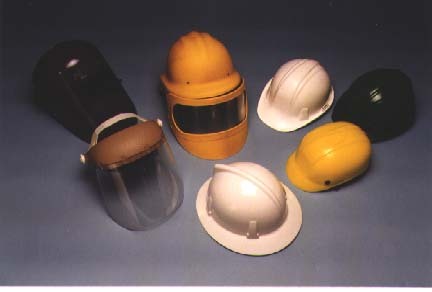 For hard hats, welder’s shields and other head and face safety gear as shown below. A SUPERIOR TERRY CLOTH SWEATBAND THAT CONTINUES TO SOAK UP THE SWEAT FROM THE FOREHEAD AND HELPS CONTROL BODY HEAT. MOISTURE- CAPILLARY ACTION-WICK EFFECT Comfort Bands act like a one-way sponge drawing in the sweat and moisture from the forehead and pulling it around to the front where it evaporates keeping the user's forehead dry. This evaporation also helps the cooling process below. HEAT - THERMODYNAMICS - HEAT TRANSFER Comfort Bands draw the heat away from the forehead to the front where it dissipates keeping the user cooler. Comfort Bands also reduce heat loss in frigid conditions by keeping the plastic bands away from contact with the user's forehead. HEADGEAR SLIPPAGE: Comfort Bands helps head and face safety gear stay in place and helps keep the headgear on while bending over. REUSABLE: Comfort Bands are made of 97% cotton and 3% polyester with hook and loop closer tape with all edges surged. This product can be washed and reused many times which will save company's money and help reduce waste to the environment. HYGIENE: Many workers receive rashes from head and safety gear. By changing and washing Comfort Bands regularly this will help reduce rashes to the forehead. EASY INSTALLATION: With the hook and loop closer tape, Comfort Bands are easier and faster to install then other products. COMFORT: Comfort Bands give workers the added comfort they need with wearing safety face and head gear for the long hours they work from hot days of the summer as a sweatband, to the cold days of the winter, keeping the cold hard plastic away from the forehead.